Beer witness to this extraordinary blend. Whenever you hear the phrase "Doubled and Twisted", you know you're dealing with primo stuff. It's an ancient term for when the best kind of liquid starts to run off the pipe from the still. And trust us, Maestro Distiller Marko Karakasevic knows a thing or thousand about good stuff. When his dad Miles arrived to North California, he already had a dozen generations worth of Old World knowledge in his pocket. Now his son Marko carries on the torch in the only family business in the United States that produces this kind of array of handcrafted wines and Spirits. What he created with Doubled & Twisted is an amazing blend of Straight Malt, Stout, and Pilsner Whiskey. Yes, you read that right: this blend includes distillations of two beers especially brewed by Bear Republic. And here's a little secret: while the Single Malt and Pilsner Whiskey were aged in new American oak casks, the Stout was aged in French oak barrels that used to hold Chardonnay! The result is a delicious, spicy and oaky blend that would make all twelve generations proud. 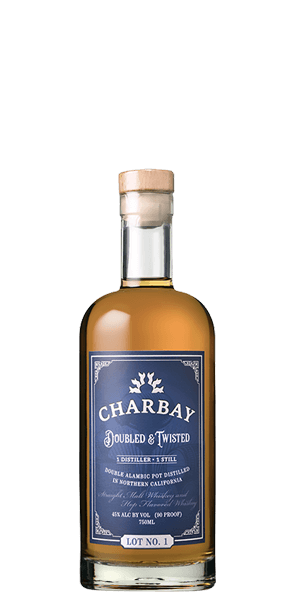 What does Charbay Double & Twisted Whiskey taste like? The Flavor Spiral™ shows the most common flavors that you'll taste in Charbay Double & Twisted Whiskey and gives you a chance to have a taste of it before actually tasting it. Strong aroma of Single Malt with a sweet cereal note. A unique and spicy combination of notes of cayenne pepper, green herbs, and lemon oil. A bit peppery finish to otherwise honeyed and malty Whiskey.